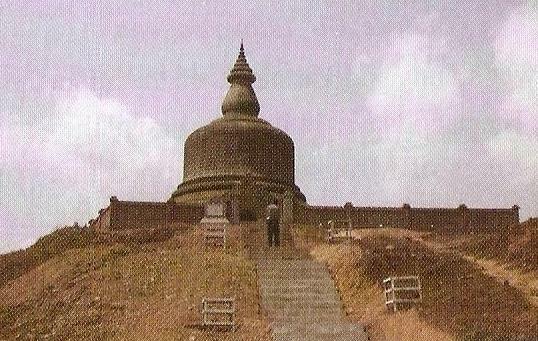 The eastern Myatasaung pagoda and the western Myatasaung pagoda built by king Min Saw Mon, are situated on the hills which are 41 feet high and 500 feet far away from the north of Laymyatnar pagoda. Those pagodas are the contemporary pagodas of founding Mraukoo. The pagodas were made of stone, and the wall of the surrounding pagoda and the stairway, were made of bricks. Both of the pagodas have the same size and similarity. The stone Buddha image which is 6 feet high, is inside the pagoda. There are four surrounding pagodas which were made of bricks at the four corners within the brick wall. There were monasteries in which the monks lived near the pagoda. That monastery was called Myatansaung monastery. It has been said that the monks from Myatasaung monastery went to Srilanka for their missionary work in the time of king Min Hla Ra Zar and king Min Ra Zar Gyi. Nowadays, the pagodas look collapsed and it is necessary to restore them.